← Honestly, the BEST braised short ribs I’ve ever made…it’s true. This new little spot opened up near me called 320 Wine Lounge on La Brea and I can happily report that I’ve had a few lovely evenings there. They have good service and a great wine list. Low and behold, he tells me about a wine tasting event they’re having a couple weeks later with the Jaffurs wine makers. “They’ll be pouring new releases and some library wines.” Well… “where do I sign up! ?” was my only response. 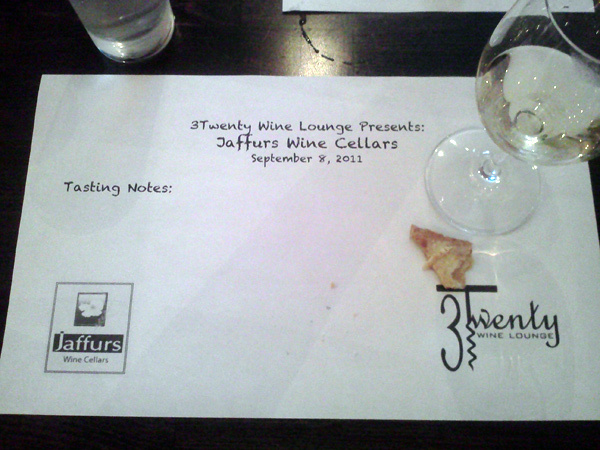 A couple weeks later my girls Jen and Mags joined me for an evening of Jaffurs wines w/food pairings (according to the invite). When we arrive (a couple minutes late) the lecture is still being given, but thankfully they weren’t waiting to pour until it was over. We started with the Grenache Blanc. It’s lovely, light and crisp… perfect for a hot day. There are some crackers on the table… that’s can’t be the ‘pairings’ the invite stated. 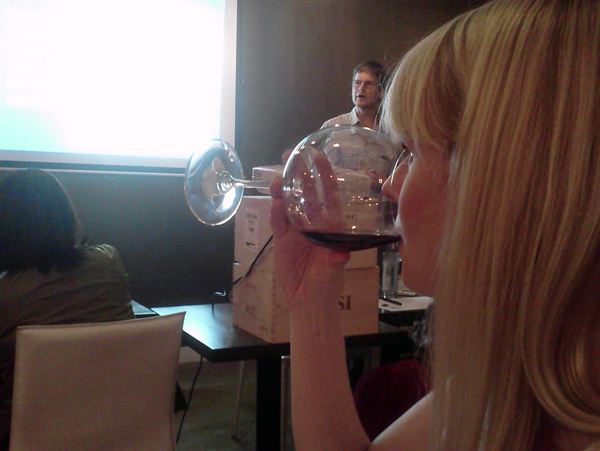 Next they bring out the Viognier and the Roussanne… both lovely, but the Grenache is my fav out of those. 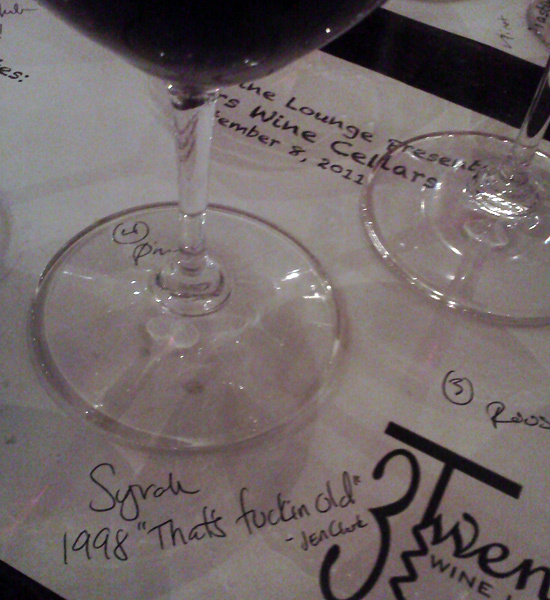 Next we get nice pours of a Syrah, a Petite Sirah and then a Mourvedre…and the pours kept coming! 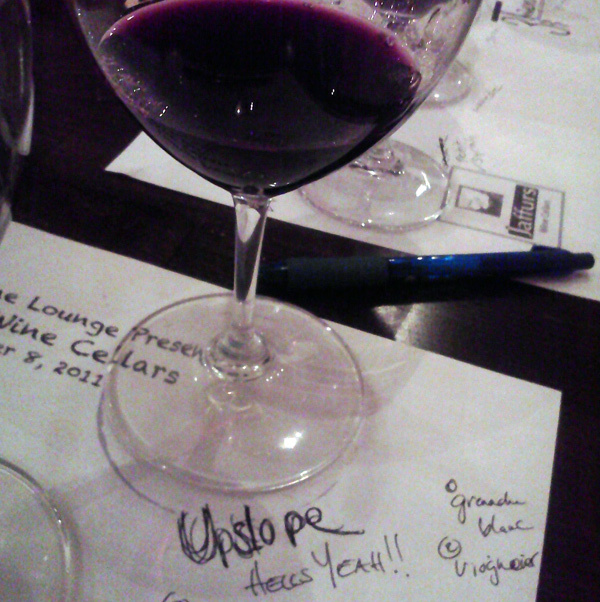 Then the Upslope and the library wines are starting to pour… YUM!!! These were so good. I have a bottle up the Upslope that I purchased a while back… hadn’t tasted it upon purchase, but I just knew it’d amazing. Sure enough, it was just as I’d imagined. Delish! 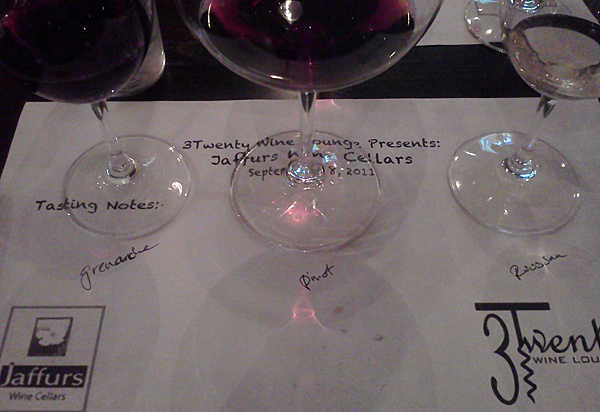 Now at this point we’re on glass 203 of this tasting and I’m still looking for the food pairing part of this evening…they were great pours and they kept coming… almost too fast, but all this and no food? Can’t be. The last of the library pours are happening and we’re enjoying every sip. Finally we are told thanks and the tasting is over… no food. Now, I’m not saying this evening sucked by any means, but if you’re pouring that much wine that quickly and the invite says “…and food pairings” then you better well give the food pairings! Over all still great wines… just next time sort out the balance when an event like this happens. It’s sorta important!